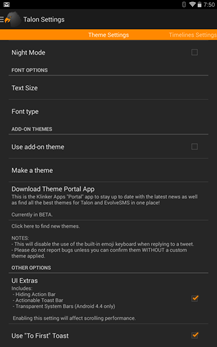 The Portal app isn't on the Play Store - you can download the beta version directly to your device in the Theme Settings menu of either Talon or EvolveSMS. It's pretty barebones at the moment, with a basic theme gallery (no downloads) and periodic updates from the developers on the primary apps. 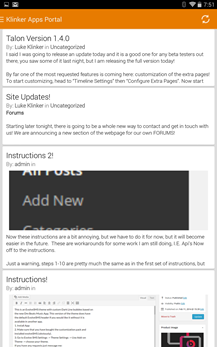 According to Klinker's Google+ posts, the functionality of the Portal will gradually be expanded. 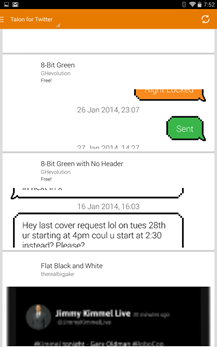 You can still download themes directly from the Play Store. As far as the updates themselves go, Talon gets customization options for the two pages to the side of the primary timeline view, a long-tap option to remove favorite users, a progress bar for the integrated browser, and a few stability and bug fixes. The upcoming EvolveSMS update is more drastic, adding SMS backups to Google Drive and Dropbox, emoticon display, new options for contact images, and more themable portions of the app.